The Colombian military has killed at least four peasant protesters in the region of Catatumbo, wounded dozens more (including 21 gunshot wounds) and arrested hundreds. 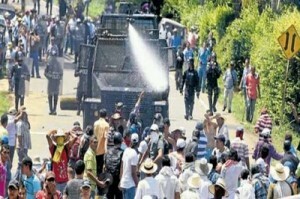 In Catatumba, peasants have been holding protests, blocking roads and occupying facilities to protest to the government’s chemical spraying of Monsanto’s RoundUp Ultra herbicide as part of coca eradication efforts; and the refusal of the government to establish a Peasant Reserve Zone, as authorized by legislation in 1994 and 1996. That legislation would provide protected land for collective farming. Protesters say that they are being denied this in favor of concessions made to foreign coal [and oil] companies. Learn more about the background of the protests here, then send a letter to Colombian officials demanding an end to the violence. Caracas, June 2nd 2013 – The Venezuelan government will continue its efforts to increase national food production and combat the use of Genetically Modified Organisms (GMOs) through a new Law on Seeds, president of the Agri-Food Development Subcommittee for the National Assembly Alfredo Ureña announced on Friday. Two million people in 52 countries marched against Monsanto last week in protest of genetically-modified food and in support of consumer choice. There’s international pressure on this GMO giant like never before. But proposed legislation in North Carolina would make it illegal for whistleblowers to expose how Monsanto and other corporations are threatening public health and the environment. The global March Against Monsanto took place in more than 50 countries last Saturday, with more than 430 simultaneous protests chanting down the walls of the 1%. The numbers are staggering: an estimated two million protestors turned out world-wide. Las Vegas saw over 2,500 protestors coursing through its arid streets. Five hundred marched in Anchorage, Alaska; thousands thronged the state capitol of California; rallies broke out throughout the US, raising the voice of dissent: “No more lies! No more greed! We don’t want your toxic seed!” From Vancouver to Buenos Aires; Durban to Stockholm; exuberant protestors danced and shouted for the downfall of Monsanto’s global empire. 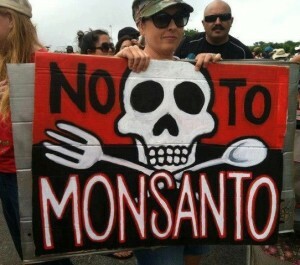 The current round of protests in the US are linked to the recent “Monsanto Protection Act,” which makes it legal for Monsanto to sell potentially unsafe seeds in spite of judicial injunctions. 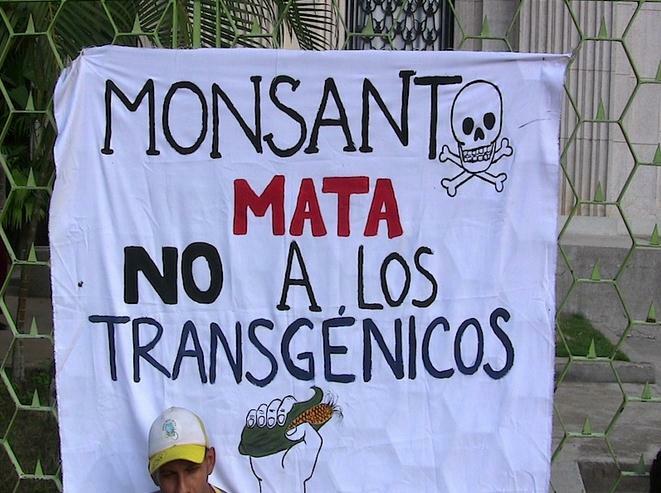 But internationally, Monsanto is generating attention for increasing its stake in global agro-development. Monsanto has inserted itself into the new Scramble for Africa like a knife in the back of the starving poor. Its seeds have become the continent’s new blood diamonds. Yesterday, May 25, 2013, huge numbers of people all over the world took to the streets to protest Monsanto and demand an end to Genetically Modified foods. Below are images from just some of those marches. Four activists from the Mexican branch of the international environmental organization Greenpeace climbed the Estela de Luz monument in downtown Mexico City on May 16 to protest efforts by multinational companies to increase the commercial use of genetically modified organisms (GMOs) in the country’s corn crops. The protesters unfurled a 70-meter banner reading “No GMO” and showing an ear of corn with a time bomb. Near the monument Greenpeace spokesperson Aleira Lara told reporters that transgenic corn is a time bomb for the Mexican countryside, since it endangers the 59 native strains of corn. The activists continued the protest for four hours and then left in a van; the Mexico City police made no effort to arrest them.